I have lots of excuses. I will catch up just after the Lotusphere. Moreover, this post will be an early birthday of my LotusNotus blog. For a couple of months, my other daughter Defne had some problems with her adenoid. We had to wait for Damla before taking action. Last week, we decided to end this problem and yesterday, after a very successful operation, doctor removed the inflated adenoid. Being son of two doctors makes me knowing too much, which means a great stress about this surgery. Fortunately, Defne is well and we returned back to normal life at home. Over the course of this storm, I could not find enough time and energy to prepare for Lotusphere. You wouldn't believe, but I still don't know which sessions are there and what's going on with the agenda. Anyway, today I'm starting to pack things up and schedule my trip details. 2011 was fantastic for me. It all started with the first LUGTR conference in March, thanks to our keynote speakers Ed Brill and Uffe Sorensen. I attended several events; DNUG and UKLUG on May and BP Summit in Poland on October. I did lots of XPages, participated the first OpenNTF contest, took my place on XSnippets project with a fantastic team and presented a couple of sessions in local conferences. 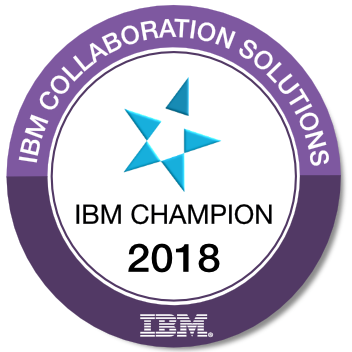 The most important event was that I have been recognized as an IBM Champion on Lotus brand. In client-base; I'm even. I got a couple of new clients on Domino but lost a couple to Exchange. I'm still in Lotus business as I have been in last 8 years and have no intention to drop it soon. I'd like to thank all of my readers, motivating me to blog... See you all at Lotusphere!! !